Researchers propose to focus on the problems of catalysis and heavy element chemistry for fuel reprocessing—both of which are of immediate interest to the Department of Energy (DOE), are representative of a very broad class of problems in chemistry, and demand the enormous computational resources anticipated from the next generation of leadership computing facilities. Also common to both is the need for accurate electronic structure calculations of heavy elements in complex environments. Catalysis: A catalyst greatly improves the efficiency of a desired chemical reaction, and catalytic processes are directly involved in the synthesis of 20% of all industrial products. Within the DOE mission, catalysts feature prominently in cleaner and more efficient energy production, exemplified by the fuel cell and storage technologies. To date, catalysts have been designed largely using trial and error, e.g., synthesizing and testing a potential new catalyst to determine if the reaction is more efficient. This process is both expensive and time-consuming and rarely leads to novel catalysts. 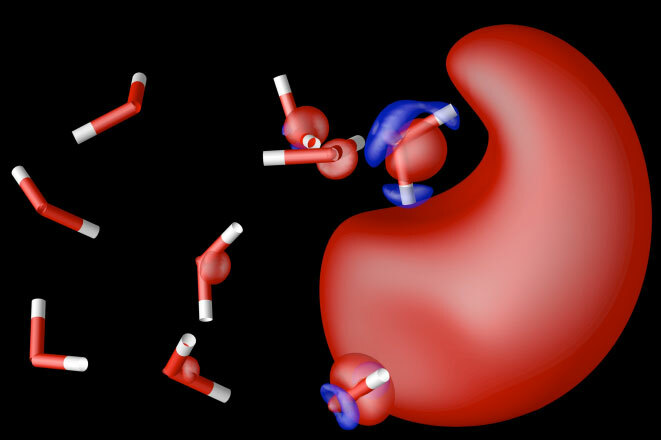 Computational modeling and simulation can improve this process, supporting experiment by improved analysis and interpretation of data, and ultimately, in partnership with experiment, enabling the design of catalysts from first principles. Researchers will focus, in collaboration with experimentalists at ORNL, on chemical processes on imperfect metal-oxide surfaces. Heavy element chemistry for fuel reprocessing: In collaboration with experimentalists and theorists, researchers will focus on two aspects of heavy element chemistry for fuel reprocessing: molecular interfacial partitioning and ligand design. Critical to both are rapid, yet quantitative, models for the interaction of heavy elements with novel organic ligands, and the interaction of both with a multispecies solvent. Speed is essential for combinatorial design due to the evaluation of a huge number of candidates, and also to enable ab initio dynamics for the inclusion of finite temperature and entropy.